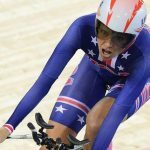 It may come as a surprise that an Olympic medalist (Team USA, Cycling, London 2012, Silver) is writing to you about the horrors and repercussions of farm animal cruelty and the confinement of animals used for food. However, that is exactly what I hope to bring to your attention in an effort to discuss the animal welfare policies for Tokyo’s 2020 Olympics menu. Why do I care? What is my motive to speak with you about the menu of the 2020 Summer Olympic Games in your beautiful city of Tokyo? Allow me to explain. I care about animals, indeed, but I also care deeply about humans: their health, nutritional needs, and, in this case, the demands for premium nutrition at the Olympic Games, where athletes from around the world are primed for the most important moment of their athletic careers. What we eat defines what we can output. Premium fuel equals premium output. Low grade, stress-filled fuel equals low-grade output. It really is that straightforward. It is of enormous importance that you offer the very best, top-quality, premium food in the athletes’ village at the 2020 Olympic Games. I am writing to implore you take science, facts, and anecdotal evidence into consideration as you make key decisions on the food you will feed the over 10,500 athletes competing in Tokyo’s Olympics in 2020. I am asking for the food served in the athlete dining facility to come from 100% cage-free eggs and 100% gestation crate free pork. Please make best efforts to reach this goal, and clearly notify the public about your progress. This commitment is in line with previous policies adopted by Olympic committees in the recent past. In 2012, London Olympic Games served free-range or organic eggs and prohibited using pork raised in the abusive confinement. In 2016, Rio Olympic Games also used eggs that are produced without using cages, and corporations voluntarily prohibited using pork products that came from pigs raised in abusive confinement. It is important to note that the global cage-free egg movement is gaining momentum in nearly every country worldwide. Globally-recognized retail, restaurant, and food manufacturing corporations have pledged to source only cage-free eggs by 2020 or 2025. This shift continues to pick up speed, especially as consumers learn about the abusive treatment of farm animals through information made readily available on the internet, social media, and films. People will gather in Tokyo from all over the world to experience the best quality of everything the city has to offer. If you do not update the policies and food quality acceptable in our city’s Olympic Games, your city could be viewed as behind the global trend toward improved welfare standards for animals in factory farms. This is extremely problematic. Let’s first look at the science and evidence behind typical pork production, followed by egg production from battery-caged hens. The EU prohibited the use of confinement for pregnant sows. In the United States, Florida, Maine, Rhode Island, Oregon, Arizona, and California prohibited the use of confinement for pregnant sows. Pork sourced from confined pigs is detrimental to the physiology of those who consume it. “On commercial farms, pigs are subjected to handling practices which can cause acute stress.” The repercussions of such stress are vast, increasing their production of hormones such as catecholamines and glucocorticoids (1), which we then ingest. Glucocorticoids are absorbed orally (2), and are associated with loss of muscle and bone mass, decreased testosterone levels (3,4), and depressed immune function (5). They affect blood sugar and cardiovascular function, and are even linked to undesirable mood alterations (4). Needless to say, each of these parameters is highly relevant to elite athletes in the days preceding competition. The taste of appropriately housed pork will also be superior, leading to greater enjoyment of the culinary experience. “In addition, stress affects meat quality and an increase in incidence of pale, soft and exudative and dark, firm and dry meats, and reduced meat quality was found when stressful handling systems were used.” Stress biomarkers such as alpha amylase increase just one minute after pigs are immobilized with nasal snares (1), suggesting the importance of well-sourced pork not only for athletic performance, but for superior taste as well. On a factory farm, the truth is, from about seven months after a sow is born, she’s on her own, spending 2 to 2.5 years in a tiny crate and kept perpetually pregnant and made sick from breathing in her own waste while fed food packed with antibacterial drugs, and sometimes even garbage. The EU prohibited the use of battery cages and several states in the United States, including California, Michigan, Ohio, Washington, Massachusetts, and Delaware, have prohibited battery cages. More states are likely to follow the prohibition. Eggs produced by free-range hens offer greater potential to high-performance athletes than conventional caged eggs. A report from 14 independent farms found that “eggs from free-range hens had approximately 4 times the amount of vitamin E (7).” This nutrient is particular significant to athletes dining at Olympic Village. “Acute intake of vitamin E … may offer athletes a performance benefit around competition time (8).” Free-range eggs also contained 8 times more β-carotene than caged eggs (7), a nutrient shown to improve 5000 meter run performance (9). These eggs also contained three times as much omega-3 (7), which conveys cardiovascular and anti-inflammatory benefits (10). The difference in nutritional contents are stark and may lead to marked differences in performance outcomes. Cage-free eggs may also offer safety benefits. 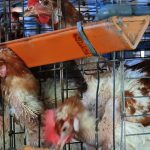 Research from multiple countries including Germany, the United Kingdom, France, Belgium, and Denmark found that eggs from conventional cages were associated with human Salmonella Enteritidis disease, whereas no association was found with eggs from free-range or organic operations (7). Since minimizing risk of foodborne illness is obviously a high priority for those dining at the Olympic Village, it is evident that the likelihood of optimal performance and health alike, are best supported by the procurement of cage-free, rather than caged eggs. Is food from this environment really what you want to feed your Olympians? I hope the answer is a resounding NO. Tokyo Olympic Committee (or Mayor of Tokyo, Ms.Yuriko Koike), I believe that you can adhere to the progressive standards previously established by Olympic Committees in your food choices for Olympians competing at the Games. Choosing food menu items sourced from free roaming animals could be one of your many legacies from the 2020 Olympic Games, as it will promote health, well-being, and record-setting performances from the competing athletes. As an experienced athlete and Olympian, I am partnering with local farm animal welfare specialists from Animal Rights Center and The Humane League, and we are more than happy to meet you in Tokyo to provide necessary information for Tokyo Olympic Committee to implement improved chicken and pig welfare standards.